Monty Python Rabbit Shirts and Gifts. Very cool design! Our Monty Python Rabbit line features the horrific bunny that causes Sir Robin to soil himself...twice. It's no ordinary rabbit, that's for sure and it makes quick duty of beheading the and disemboweling the brave knights that face it. 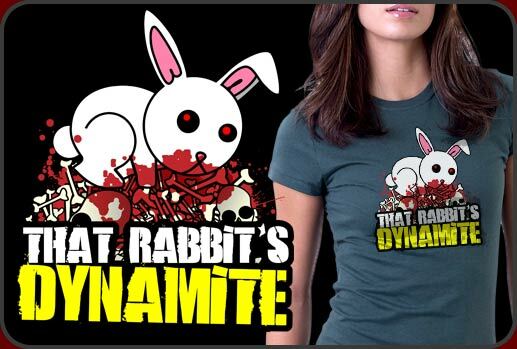 Our Monty Python Rabbit design includes the seemingly cute bunny feasting on the bloody remains of our hapless band of knights and the words "That Rabbit's Dynamite" as a base to the graphic. Monty Python Rabbit shirts look terrific printed on either light or dark colors and make a very cool edition to any Monty Python fan's t-shirt collection. We have lots of cool Monty Python Rabbit shirts for men women and children and we also have a few cool gift ideas including the image as well.